A famous family recipe – San Marzano Tomato Sauce. Savory, Italian flavors, simmered for several hours developing a rich and hearty tomato sauce. Easily the best tomato sauce I’ve ever had! This San Marzano Tomato Sauce is quite special. It was the very first recipe my mom ever taught me and was the very beginning of my love for food. For years this sauce has brought my loud, bold, and very loving family together and has been a part of many memorable family dinners. 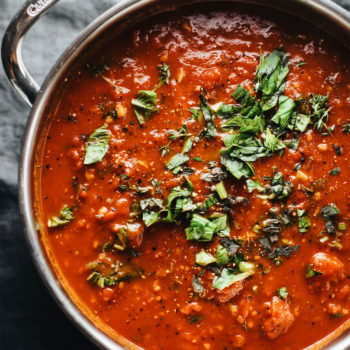 First steps for making this sauce – put some Frank Sinatra on, grab a glass of vino, and enjoy the cozy aroma of simmering garlic & tomatoes and the authentic flavors of this incredible Italian tomato sauce. From my family to yours..
Why are San Marzano tomatoes the best? 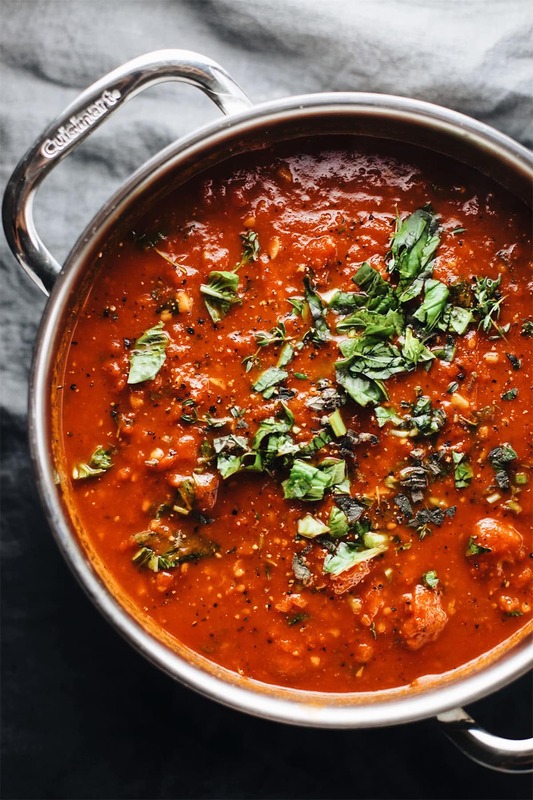 San Marzano tomatoes are not just a staple in my family’s famous recipe, but are considered to be the best tomatoes in the world to use in sauces. These tomatoes are set apart from others because of their rich flavor and low acidity. They are also known to have a thicker consistency compared to other canned plum tomatoes. Saute garlic in olive oil: Saute your minced garlic for 30 to 60 seconds on medium heat – constantly stirring. Using tons of garlic in this recipe will give your tomato sauce the foundation of it’s flavor. Add Tomatoes – cook low and slow: The key to a good tomato sauce is cooking it for up to 4-6 hours. This allows the sauce to thicken, flavors to richen and develop, and acidity to balance. Add herbs at very end: Cooking herbs in the sauce for hours can actually result in bitter flavor. For a fresh, vibrant herb flavor add at the very end when sauce is finished for best results. Use San Marzano Peeled Tomatoes: to make a perfect tomato sauce you need San Marzanos. These tomatoes give your sauce a thicker consistency, and are sweeter, richer, and less acidic in flavor. Use Amore Sun-Dried Tomato Paste: Rather than using normal tomato paste, my family loves to use this sun-dried tomato paste for it’s thickening factor and extra added depth of flavor. Add a Parmesan cheese rind to your sauce while it simmers. This will instantly add flavor. The rind won’t melt (though it will get soft); it will just sit in your sauce or soup and infuse it with extra umami and savor. Any type of pasta – spaghetti, rigatoni, orecchiette, or penne. 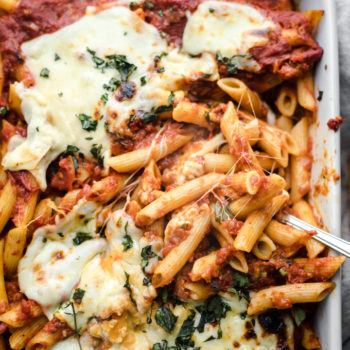 Stuffed shells, eggplant parmesan, or lasagna. Zucchini pasta or spaghetti squash. 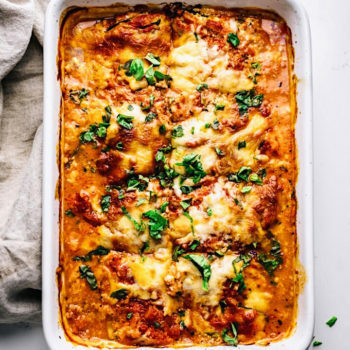 I also use this recipe in some of my favorite recipes – Authentic Italian Chicken Parmigiana and Italian Sausage Lasagna. 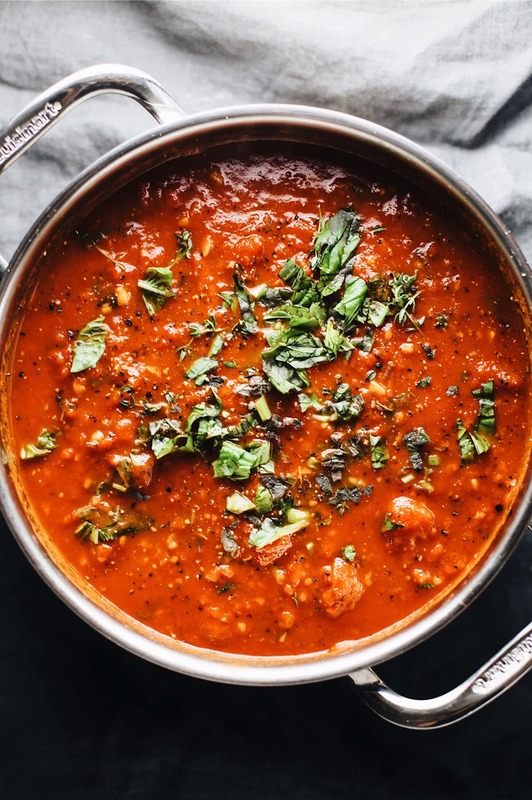 I hope you love this San Marzano Tomato Sauce – it is dear to my heart and to this day haven’t tasted an Italian tomato sauce like it. 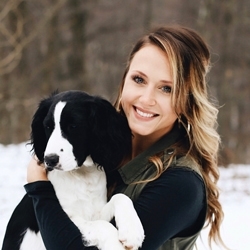 Got Pinterest? Pin this recipe to your Pinterest boards! A famous family recipe - savory Italian flavors, vibrant herbs, simmered for several hours to develop the perfect hearty tomato sauce. Easily the best tomato sauce I've ever had! In a large pot on medium heat saute garlic in olive oil for 30-60 seconds - constantly stir. Garlic can burn very easily in this process. Add San Marzano tomatoes to garlic. Add tomato paste, salt & pepper. Mix, and cover on low heat for 4-6 hours. Stir occasionally to avoid burning. The whole tomatoes will break down as they cook and result in a thicker, chunkier sauce. If you prefer a smooth sauce you can use a hand-puree tool or transfer to a high-powdered blender. When sauce is finished mix in fresh herbs. Serve with your favorite pasta, lasagna, or chicken parmesan. 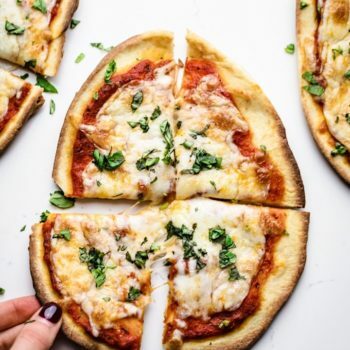 Use Amore Sun-Dried Tomato Paste: Rather than using normal tomato paste, my family loves to use this sun-dried tomato paste for it's thickening factor and extra added depth of flavor. Add a Parmesan rind to your sauce while it simmers. This will instantly add flavor. The rind won't melt (though it will get soft); it will just sit in your sauce or soup and infuse it with extra umami and savor. Fresh Herbs vs Dried Herb Measurements: Because dried herbs are generally more potent and concentrated than fresh herbs, you'll need less -- typically three times the amount of fresh herbs as dry. For example, since this recipe calls for 2 teaspoons of dried Oregano, you'd need 2 Tablespoons of fresh oregano (since 3 teaspoons equal 1 tablespoon). Made this in crockpot and is amazing!!! Thank you for sharing this wonderful recipe!!! Yay! Thank you, Sherri 🙂 So happy you loved it! I am hosting a party for 26 people, the recipe serves 8. Please advise. Hi Steve, It depends on portion sizes – my recipe says it serves 8 but they are big portions each so it could squeeze to 10. I would say at least 12 28oz cans of tomatoes for 26 people. Double the amount of garlic, tomato paste, and the herbs. 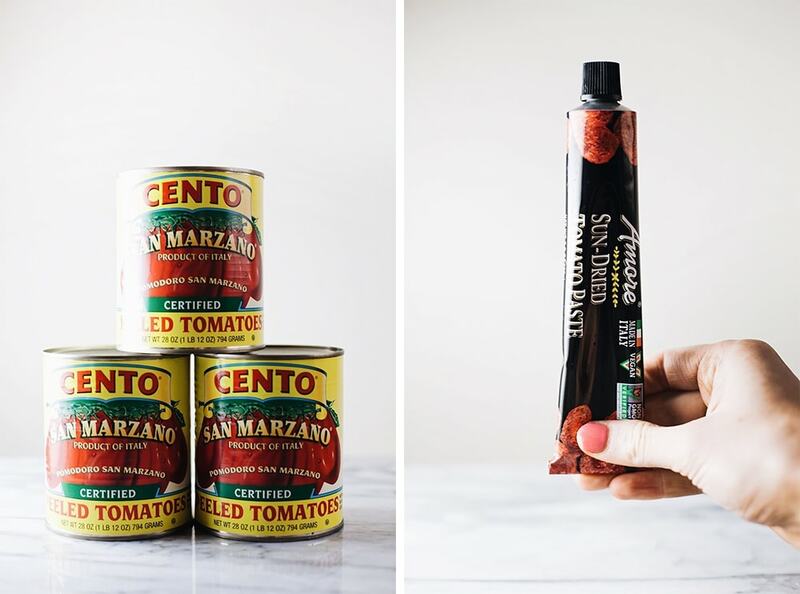 I also like to mention that you do not HAVE to use Cento brand – there are other brands of canned San Marzano tomatoes that are more affordable, especially when making a bigger serving. Hope this helps!! I’m planning to can this recipe, so should I leave out the herbs at the end until I open the jar to use? Found the recipe last week and finally taking the time to make it. The sauce is simmering now; two hours remaining. However,, it looks sooooo good that we’ve sampled it already! I’m so happy to hear! There is nothing better than this sauce simmering and developing that rich flavor. Enjoy!! This is almost identical to the one I make! There truly is nothing quite like it. If I want to add ground beef, should I add it in right away? I would cook the sauce, then brown the beef in a separate pan and let cook with the sauce for the last 30 minutes. Bethany, it’s really awesome! This will quickly become a favorite in our house! I want to make this sauce, if I make it with 2 or 3 cans do I just half rest of the ingredients? Thank you in advance!